For the second year in a row, I had the pleasure of joining Jerry Berg, Dan Henderson, and Bruce Conti at the DXpedition site in Chamberlain, Maine. This time JB, DH, and I stayed for 3 days, and everyone of them were productive. I'd say that for me, this year's DXpedition exceeded the previous year's. Man-made noise levels in Chamberlain were relatively low, and atmospheric noise would decrease as the day went on. Some of my best logs were taken during a full day of rain, interesting to me because two of the better days this DX season occurred during nor'easters. Propagation tended to favor signals to the south, perhaps enhanced by the bottle of Cuban style rum that Bruce shared with us. Besides numerous Bolivian and Peruvians heard, I had a tentative logging of Radio América, Paraguay (later confirmed to be them by the Station Engineer) and a possible third harmonic of Ecos del Atrato on 15058 kHz. The only lowlight was not hearing any Europirates. 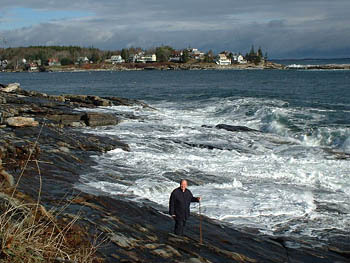 George Maroti, Chamberlain, Maine DXpedition November 21-24, 2002. Drake R8B with 500 foot longwire oriented 200°, fed by coax and 9:1 minicircuits impedance matching transformer. 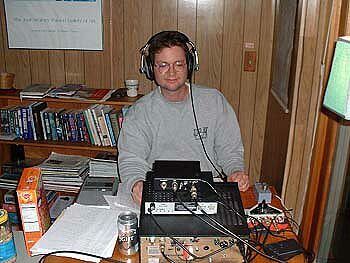 George Maroti trying out his new Coors active indoor antenna (picture from 2001 DXpedition). More from Bruce Conti: DXpeditioning in Chamberlain, Maine Nov 21-23, with Jerry Berg, Dan Henderson, and George Maroti, transatlantic reception was disappointing except for a strong signal from 783 Mauritania. WWV reported an A-index in the thirties with activity at minor storm levels. Latin American DX was dominated by Venezuela. However, most were broadcasting "béisbol profesional venezolano" during primetime and unlike US stations they don't pause for station identification at the top of the hour, making identification difficult. Stormy weather in the northeast and thunderstorms down south due to an associated cold front produced high noise levels the morning of Nov 23 to increase the difficulty factor. Upon arriving Nov 21, an Invisible Fence was being installed to keep the landlord's dog in the yard. The installer said it operated on 560 AM. 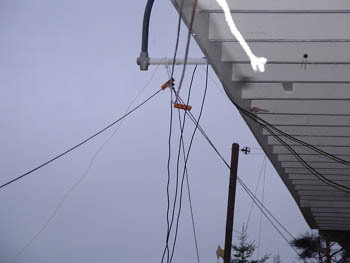 A slight hum was detected, but the installer wouldn't QSL. unterminated and Kaz-terminated, 75-m northeast 60° unterminated. 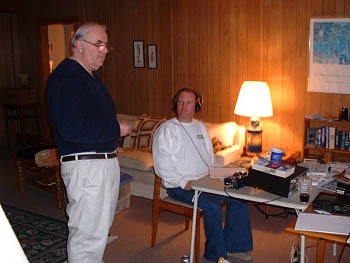 More from Jerry Berg: The following shortwave logs were made by me (JB) during a shoreside DXpedition to Chamberlain, Maine (Pemaquid Peninsula), November 21-24, 2002, with DXPers Dan Henderson and George Maroti, and BADXer/PopComm MW Editor Bruce Conti. Conditions were good overall, albeit with heightened QRN due to stormy weather. 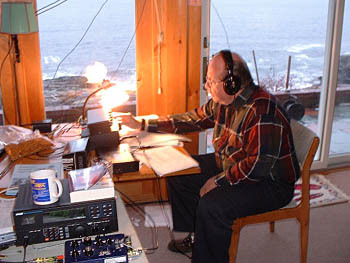 Jerry Berg, Chamberlain, Maine DXpedition November 21-24, 2002 Equipment: R8 receiver; 500 foot longwire; multi-wire "floppy dipole" cut for 60-31-19 m.
Receiver: AOR7030 Plus, Grove TUN-4A antenna tuner and preselector, and 500' longwire antenna with Maroti isolation transformer for noise reduction.